Meet Sam, an app that could be running Dr. Joseph Kvedar’s lifestyle regimen in the future – along with a lot of us. 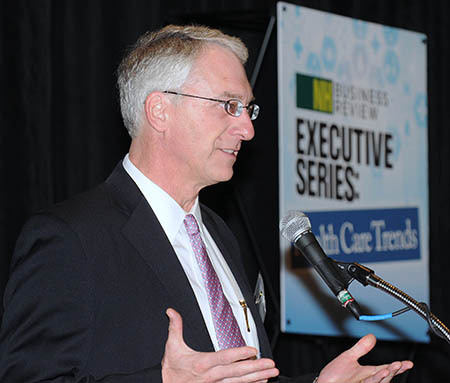 At least that’s the way the keynote speaker, vice president of connected health at Boston-based Partners HealthCare, described it to those attending New Hampshire Business Review’s Executive Series on Health Care Trends. Harvard Pilgrim Health Care was the presenting sponsor of the event, which was held Thursday the Grappone Conference Center in Concord. Sam, who would reside on Kvedar’s smartphone, is kind of like Apple’s Siri, but “more like a drill sergeant,” since that is what Kvedar knows he needs if he is going to lose enough weight to fit into the tux he ordered for his daughter’s wedding. So when Kvedar wakes up, Sam admonishes him that he is two hours short in his sleep and 25 percent deficient in his exercise goals. Sam does offer some praise when Kvedar eats a light lunch, and goes out for a walk afterwards, although it comes with a warning: He’s veering dangerously close to the bakery where he often stops to eat a large cookie. Instead, Sam offers Kvedar a coupon to a nearby gym so that he might take up swimming – a sport that he abandoned in high school, telling him that five friends in his social network have already joined. Minutes later, Kvedar gets a text from his daughter echoing the swimming suggestion and congratulating him for skipping the cookie. Most of the elements that will make this scenario possible are currently available: from simple GPS to wearable devices like a Fitbit, to purchases tacked by Apple Pay. But tying it all together into the “Internet of Healthy Things,” which happens to be the title of Kvedar’s book, is still in the future, albeit the near future. For one, it would probably take a deep discount in Kvedar’s health insurance premiums for him to give up that much privacy, he says. The industry is already moving in that direction, according to Kvedar and a group of panelists that preceded his talk. Telemedicine used to be science fiction. Now it’s being reimbursed by Harvard Pilgrim Health Care and employed by Dartmouth-Hitchcock Medical Center, according to Dr. William Brewster, vice president of the New Hampshire regional market for Harvard Pilgrim, and Dr. Robert Greene, chief population health management officer for D-H.
Once upon a time, a customer was just offered one health plan. Now, on the public exchange and increasingly on private exchanges, customers pick their own plan from a range of options on the computer, pointed out panelist Steve Gerlach, a benefits attorney with Bernstein Shur. Medical costs used to be disclosed on a bill. 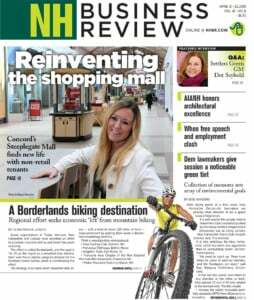 Now much of the costs are on a state website, said Lucy Hodder, director of health law and policy programs at UNH Law. The whole payment system is shifting from fee-for-service, to an outcomes-based model, which enables providers and insurers and various specialists to work together and share data. The key is to make all this more individualized, personal and social at the same time, said Kvedar, in order to get the kind of engagement that will actually get people to change their behavior. That will involve some voluntary surrender of privacy, he said, but this is already happening every time you give Google, Facebook and so many other online companies your private information in exchange for convenience or sometimes for money. Already people are giving up health data for all sorts of reasons. In addition to Fitbit and various athletic apps, such as MapMyRun, some wear a MUSE headband that measures electrical activity in the brain, to help them with meditation, anxiety and focus, or Spire, which keeps track of respiration for the same reason. There’s also Empatica, an ankle bracelet that measures skin activation and can warn of upcoming seizures, and Proteus, an ingestible sensor that keeps track of how one reacts to medicine. There are various other apps that attempt to pull this all together. But currently such “consumer-centric design” is “mostly garbage,” Kvedar said. It might work for a fitness buff, but not for patients with chronic disease that providers need to reach. The integrated software has to fit into people’s daily lives, with changing reminders and warnings and very personal short-term goals, to motivate people.